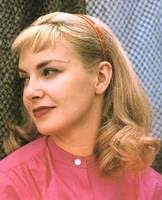 It is painfully obvious what people think about Joanne Woodward because they do not say it. 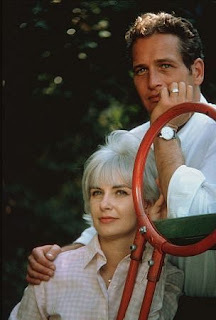 When people talk about Joanne they say she's a wonderful actress, an amazing person, and so lucky to have been married to Paul Newman. Is anything missing from that list? 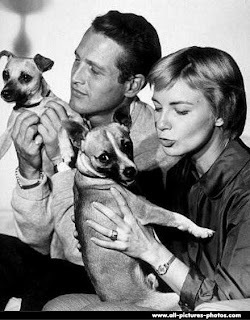 There seems to be a silent pact, made out of respect and admiration for the Newmans, and a selfish desire not to appear judgemental, to say nothing about the way Joanne Woodward looks. I think she was a pretty lady. But I bet you the most commonly thought thing about Paul and Joanne is something like, "How did she ever get HIM?" or "Gosh, he's gorgeous, but she's kind of ordinary." Nobody mentions Joanne without mentioning Paul, and secretly even the most devoted fans must wonder if the couple acknowledged to themselves that hubby was so much better looking than wifey. Almost as if he were doing her a favor by marrying her. 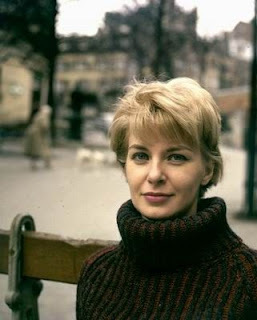 Putting aside our rather interesting fictional history together, this post is dedicated to Joanne Woodward, an effort to bring her beauty, talent, and personality out of the shadows. I wonder, if perhaps I should actually do this, because I think women feel threatened by a woman who got everything we all want without doing it the way the rest of us do. 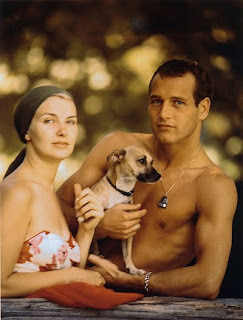 It bothers us because if skin deep qualities won't get you Paul Newman, what is it that she's got the rest of us haven't?? Seriously. All the beautiful women in Hollywood, and he chose her. Why?? 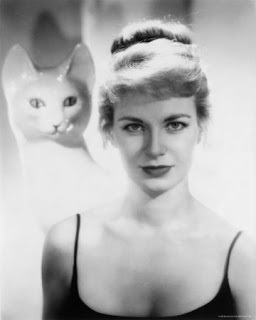 So instead of trying to convince everyone Joanne Woodward has everything we don't think she does, the focus will be on what we haven't noticed she has--those elusive traits that must be super special. Only occasionally is she really beautiful, but it doesn't matter. And I am beginning to wonder if it is just me, but does she remind you of your mother, at least in Sybil? OK, never mind. 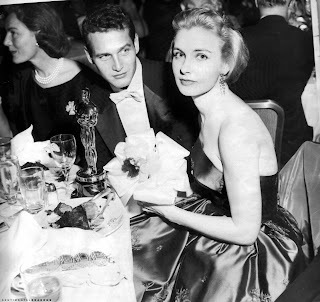 Not willing to be extravagant for the cause of glamour, Joanne made her own dress for the 1953 Academy Awards ceremony. 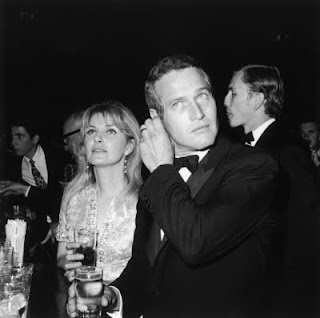 Paul Newman must have appreciated that--you never, ever hear a man complain his wife spends too little on clothing. Also, the dress is actually quite nice. She seems to have been a skilled seamstress. Because she isn't very famous apart from her husband, it is hard to find out anything about Joanne's personality. Yes, the famous personality that must be The Secret. Like I said, there isn't much about it, but what there is reveals a humorous, confident, intelligent, and down to earth woman. "Intensity is so much more becoming in the young." "I'm upset when I see that people don't seem to observe what's happening with the environment, what's happening in terms of global warming. " Her favorite activities are said to be ballet and horseback riding. Her favorite actress is Bette Davis and she prefers the theater to film. 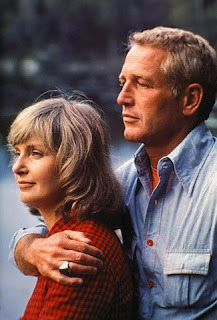 Maybe someday people will say Paul Newman was lucky to have been married to Joanne Woodward (and he was!) but at the moment she is a very unappreciated lady. Wow, Merriam, I never thought YOU of all people would be tackling a subject like this! Must of took a lot out of you, eh? Why did you do it? Guilty feelings perhaps? On Joanne herself: I so completely agree. And I love anything Joanne is in, her personality is such that you simply gravitate to her. 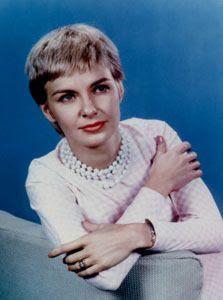 And, I have always thought she was very beautiful in the same way as Jean Simmons. They're always beautiful, but then at random moments...depending on the angle or whatever...they look absolutely gorgeous. Lovely post! Even, if it was a bit difficult for you to type. It just hit me, WHY you did this post! Remember...the dye job...and the plastic surgery? Now, it is all clear to me! Thank you, Kate Gabrielle, for your lovely comment. Thank you, Millie, for your slightly lovely comments. I'll have you know, Millie dear, I did this post out of the substantial goodness of my heart, which happens to not be feeling guilty. I wonder why you say these strange things sometimes. As if I were a criminal or something. I feel that she is so unappreciated too - what a great post with the pictures and the great points in your write-up. 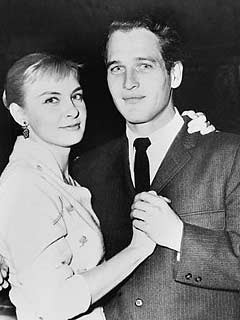 Paul Newman always showed that he admired her and I think, she is a remarkably smart, intelligent and talented woman and which, beneath it all, goes beyond beauty (though I think she is VERY beautiful). I completely agree with this peice of writing.I will never understand what Paul Newman saw in her. I'm sure she's a nice person but never came across to me as warm or attractive.I'm sure his first wife would agree! Many people think Joanne is beautiful. I think this is a nice article about her , but I still get the feeling she is not on the level of her husband in the looks department. Talent was not lacking in her that is for sure. He was also a good actor. I love both of them and thank them for all the entertainment they provided over the years. This is an old article and we are now in 2012, so they are still on the minds of people like me. 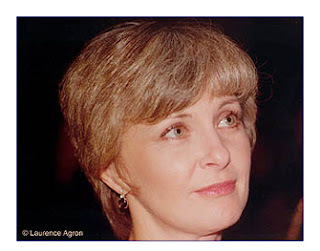 I googled to find out how Joanne is doing these days. If she is well. Thank you for lifting this subject. I too, feel that she is very much underestimated, which is such a shame since she's got such massive talent and also seems like a very loving and warm person. And I agree with you that she is very motherly in "Sybil" (which is one of my absolute favourite movies). And I think she is just stunning, in her own special way. Absolutely breathtaking. By gone brilliance?? Who are we to judge. 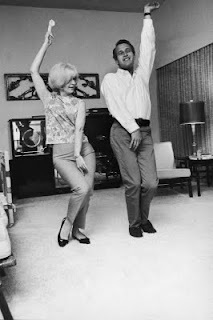 Maybe he married her because she was fun, because he admired her talent... After all, she won an Academy Award. 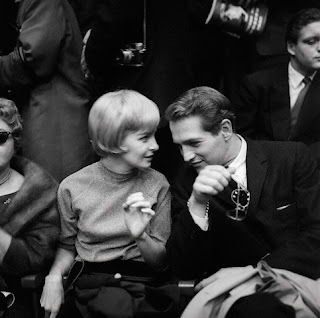 Maybe Paul Newman wanted to have someone to share deep conversations with... She is/was brilliant. Before making comments, review their combined acting careers. And don't forget their philantrophy. They had that rare magic that couples find... Leading to longevity. That in itself is brillance! It speaks well of Paul Newman himself. He and Joanne lived as regular people, never demanding special attention. Just living boldly as we each should. Paul was intelligent as is Joanne. They were smart, real people and saw those true qualities in each other. Joanne was absolutely gorgeous. Beautiful green eyes, lovely lips, slim figure. I had the opportunity to meet her twice, the first time around 1970. She was absolutely breathtaking. The author of this article appears to be mean spirited and her words remind me of someone who carries a dagger with a smile. Total unworthy of Ms. Woodward, who is a spectacular human being in every way. What a shallow, tacky blog post! As if people have to be exactly evenly matched in appearance to be happily married. Wow. "Poor Joanne" is your premise. The fact that you even think this way speaks volumes.